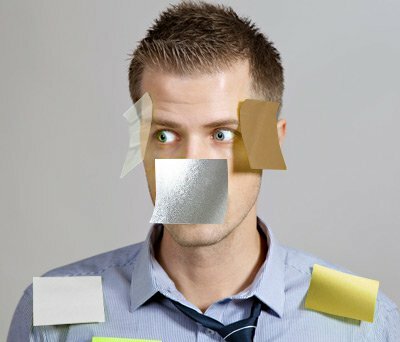 Your labels are more than stickers. Your labels have a job to do - to name your product and let the world know what it has to offer. But to do that successfully, your labels need to stick to your product or container. A simple paper label isn't going to work for every application, so here are 6 questions to help you choose the right custom label material. How Are You Applying Your Labels? If you're applying your labels by hand the label material and liner are less of a concern than if your labels will be applied automatically. Different label applicators have different requirements and it's always a good idea to check with your applicator about their capabilities and preferences. Our Account Managers can help you choose the material and look you want and make sure the liner meets your applicator's specifications. Where Are You Applying Your Labels? It's also good to think about where you will be applying your labels. At room temperature, most labels will apply without issue. In a cold, damp warehouse or outside in extreme heat label adhesives may not behave as expected. If extreme conditions simply can't be avoided when you're applying your labels let us know and we'll help you find an adhesive to meet your needs. What Are You Applying Your Labels To? If your labels are applied to cardboard packaging or uncoated paper you have it easy. Almost any paper material with a permanent adhesive will work just fine. But if your custom labels need to stick to a coated paper (it might feel waxy or slick) container, plastic or PET, or a squeezable tube there are special considerations to make. In most cases a permanent adhesive is appropriate for a plastic or PET bottle but we need to know what's inside. If you're selling vitamins, paper is fine. If you have a cosmetic product or a chemical cleaner a film stock such as polypropylene protected by a laminate is a better option. We want to make sure any drips or spills don't smear your label. If your container is squeezable, we recommend a polyolefin. If there are any questions at all about whether or not a material is right for the job testing a few samples is a good idea. What Color is Your Container? What Color is the Product Inside? A white container is a no-brainer. You can use a white or silver material without any issues. You can even use clear material if you want a particular look. But if your container is clear you'll need to decide what look you're after. If you want your product to have a "no label look" a clear film material is the way to go. A laminate will improve the clarity of a clear film label. If the product inside your clear container is colored there is a possibility that it will affect the colors on your label. We have a few techniques to help with that but it's always something to keep in mind. A colored container can also affect the colors on your labels if you choose to go with a clear film. What Conditions Will Your Custom Label be Exposed To Once It's On Your Product? It's not easy being a label on a product that goes into the refrigerator or freezer or that needs to be removed and reapplied. If your label needs to do more than stick to a product that goes into a clean, warm, dry cupboard you'll want to consider your label material and adhesive combination carefully. Special, all temperature adhesives exist for labels that will be refrigerated or frozen. 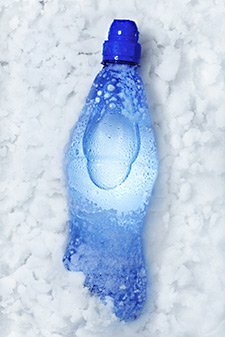 A laminate can help protect labels that see cold temperatures from condensation and frost. There are even specific materials for wines that will be chilled in ice buckets. If your label will see high heat from being applied to the back of a computer or on a circuit breaker we might recommend a polyester material with a special adhesive. All adhesives and materials have a finite lifespan, but by choosing the right combination of face stock and adhesive you can extend the life of your labels. Obviously, we don't expect you to know it all. The above questions are just a way to get you thinking about the unique conditions your label might experience. 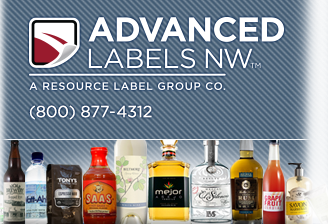 Our team at Advanced Labels can help you with your final decision and ensure your label's success. If you would like to see samples of our various custom label materials, let us know!